Home / disney pixar / Gaga On Social Media / globe / Disney, Pixar, Marvel, and Star Wars Content in One App! Disney, Pixar, Marvel, and Star Wars Content in One App! Through Globe Telecom, DisneyLife makes its first release in Asia. Disney fans can enjoy over 350 movies from Disney, Pixar, Marvel and Star Wars; more than 5,000 kids’ TV episodes; and over 6,000 music tracks, all in one app. Fans of all ages can access the best of Disney’s world-class stories at their fingertips and enjoy shorts, behind the scenes and other exclusive content on-the-go. In addition, all content on DisneyLife can be downloaded and enjoyed for offline viewing and listening. "In the three years we’ve been working with Disney we’ve provided our audiences many unique and innovative entertainment experiences. Today we are launching the first complete entertainment app in Philippines that carries movies, TV series, and music from the world’s biggest family entertainment company. 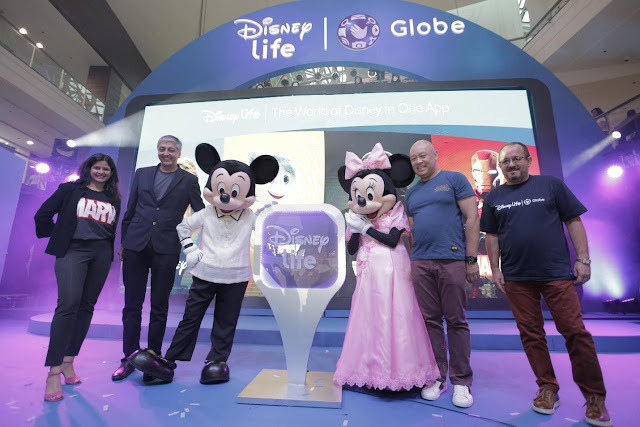 The DisneyLife app will super-serve Filipinos with entertainment when they want it, where they want it,” said Ernest Cu, President and CEO of Globe. Kids and families can enjoy new episodes of their favorite Disney television series first on DisneyLife. These episodes and the classics can be streamed from the biggest library of Disney Kids’ TV series including favorites such as Disney Channel’s Big Hero 6 and Tangled; Disney Junior’s Mickey and the Roadster Racers; and Disney XD’s Spider-Man and Star Wars Rebels. DisneyLife users will have access to an extensive library of soundtracks from Disney movies’ and TV series’. Through the magic of music, fans of all ages can wander the seas with Moana, feel empowered with Frozen, and enjoy family moments with Coco. All existing Globe Postpaid customers and new or recontracting customers on ThePLAN or ThePLAN PLUS 999 and above get a free 6-month subscription to DisneyLife. DisneyLife offers are coming soon with GoWATCH for Prepaid mobile customers. In the meantime, they can watch out for wonderful surprises from Disney and Globe. Stay tuned to the Globe Facebook and Twitter pages! New and existing Globe At Home Postpaid customers who applied or upgraded to Plan 1,299/up, will get a free 6-month subscription to DisneyLife. An additional free 3-month subscription to DisneyLife will be given to customers who purchase Globe Streamwatch Roku Powered. Enjoy unlimited DisneyLife movie nights with Globe At Home's Go Unli Plans with speeds up to 100Mbps and unlimited data. The DisneyLife app is compatible with iOS and Android devices and is also available to download on the App Store and Google Play Store. To learn more about DisneyLife promos, visit a Globe Store now or go to www.disneylife.ph or www.globe.com/content/disneylife for more details.